Should You Get Your Attic Cleaned? If your attic hasn’t been thoroughly cleaned recently, the answer is yes. Especially if you’re aware of unwelcome guests that have been scampering around up there. Even if it’s been a while since the pests have gone, what they’ve left behind can still be dangerous. Rodent waste can carry all sorts of nasty bacteria, which may have gotten into the stored items. When you bring them down, or even just tread in it, you might be bringing those diseases into your home. All the more concerning, if any of the rats died up there, their carcasses can also be drawing in bugs, and even more health hazards. Even without an infestation, just the dust alone can cause health risks. It can easily enter the air of your home, and be breathed in by you and your family. It may cause allergy flair ups, but it can cause far worse issues for those who already have breathing disorders, like asthma. Just being elderly can increase the risk of breathing trouble occurring from polluted air. Let Experts Take Care Of It! Our professionals can easily take care of whatever the trouble may be, and do so safely. Otherwise, it’s possible for the contaminates to enter your home in the process, which isn’t what you want at all! With our team, you can rest assured that we will carefully clean and remove any dust, droppings, or otherwise. After that’s done, we will use a sterilizing spray to decontaminate the whole attic, leaving it clean and without any potential threats to one’s health. 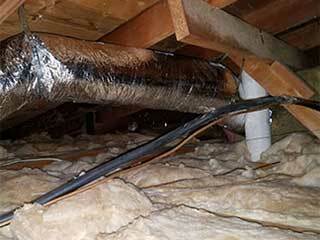 If any insulation has been damaged from pests, we can handle that as well! That way, you won’t need to fuss with trying to find another company to help you. Let us get your attic like new again, and protect you and your family’s health in the process! Contact Attic Cleaning Simi Valley today, and be safe rather than sorry. You won’t regret it!